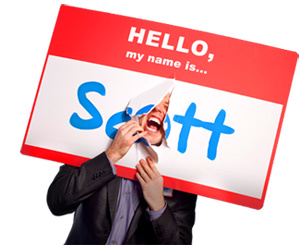 You Don’t Need to be Tom Peters to be a Thought Leader - HELLO, my name is Scott! Are you a trusted source who moves people with innovative ideas? 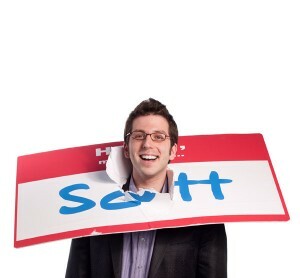 If so, then you’re a Thought Leader. You don’t need a PhD. You don’t need to be Tom Peters. You don’t need to manage some huge consulting company. You just need to think. AND: You need to capture, organize, deploy and build a following around your thinking. Remember: Nobody will be inspired BY you until they’ve heard OF you. Stop winking in the dark and start commandeering attention. Because the more attention you attract the more people your thoughts can touch. How much more visible are you than you were a year ago? Remember: If you’re not current, you’re not credible. Always run your expertise through the wringer of WHEN. How stable is your philosophy? 3. Dedicate yourself to building a HOT body. It’s not about writing one book. Or one article. Or one blog post. You’re a thinker. And as such, your goal is to constantly add to and strengthen your body of work. Don’t be a One Hit Wonder, One Trick Pony or One Anything Anything. As Julia Cameron said in The Artist’s Way, “Each day’s work is part of a larger body of work, and that body of work is the work of a lifetime. Unless we are able to take this long view, we will be derailed by rejection.” Edison registered 1,800 patents. The Grateful Dead played 2,318 shows. Stephen King published 480 books. How hot is YOUR body of work? 4. Develop an ongoing relationship with your market. Combine outreach with attraction. Make it easy for readers, subscribers and audience members to engage with you, every day. Ask for their feedback. Take heed. Take notes. They will tell you how to serve them better. They will also tell you how to sell to them better. What’s your listening platform? 5. Everything you already know about “leadership” still applies. You’re still attracting followers. You’re still a perpetrator of inspiration. You’re still superior article. And you’re still a composite of all you’ve experienced. The only difference is, the medium through which these attributes are experienced by your constituency is your brainstuff. Your thoughts. Your words. Your philosophies. Your writings. Your presentations. You don’t need a title, a corporation or a gavel to be a leader. There is no leadership. Leadership, shmeadership. There is only being and expressing yourself truthfully and passionately. Does that describe you? 6. Have a paper memory. Your brain is a moron. And if you don’t write it down, it never happened. So, the secret is simple: Take a serious inventory of your thoughts. Chronicle your thinking. Make sure everything you know is written down somewhere. Develop a unique process for entertaining ideas. What’s your Content Management System? a. Don’t just tell a story. Stick the landing. b. Don’t just write a blog. Be a great date for your reader. c. Don’t just deliver a presentation. Engage every audience instantly. d. Don’t just give an interview. Craft a listenable, unforgettable telepresence. Remember: Accessible means easy. Open. Relaxed. Attainable. Understandable. Relatable. Is that an accurate description of your ideas? 8. Mold a beautiful thought atmosphere for yourself. This space looks different for everyone. For example, my thought atmosphere includes hot tea, a rising sun, sticky notes, dry erase boards, flip charts, note cards on the floor, instant access to my content management system and hours of relaxing music by All India Radio, Marc Cohn and The Buddha Lounge. What does yours look like? Look: The world has too many smart people and not enough intellectuals. So, stop accumulating knowledge and start becoming an explorer of ideas who can extract universal truths from his experiences and apply them to anyone, anytime, anywhere. Are you an intellectual or just really smart? 10. Syndicate your expertise. Deploy, deploy, deploy! Go public with your words, ideas, philosophies, expertise and School of Thought. Fortunately, it’s easier than ever. And considering the sheer volume of diverse social media tools available, there is NO excuse for not getting your ideas out there and creating more opportunities for people to say YES to your expertise. Remember: Be out IN the marketplace with your ideas or be out OF the marketplace completely. What’s your system for shipping your idea off to battle? REMEMBER: You don’t have to be Tom Peters to be a Thought Leader. Think. Capture. Organize. Deploy. Listen. Repeat. How strong is your Thought Leadership Platform? For the list called, “17 Reasons to Write a Free Ebook,” send an email to me, and you win the list for free!